Tropical depression Irene regained some strength Wednesday as it followed a course toward the East Coast, raising the possibility it could eventually hit the United States as a hurricane, the National Hurricane Center said. Irene's top sustained wind had strengthened to 35 mph, up 5 mph from earlier in the day, and it could reach tropical storm status by Thursday, meteorologists said. Tropical storms have sustained wind of at least 39 mph. It is possible that Irene could reach hurricane strength with sustained wind blowing at 74 mph as it will be passing over warmer water, said Jennifer Pralgo, a hurricane center meteorologist. "We need to see how much it will get its act together," she said. Earlier Wednesday, the center had said the storm was becoming disorganized and could soon dissipate. 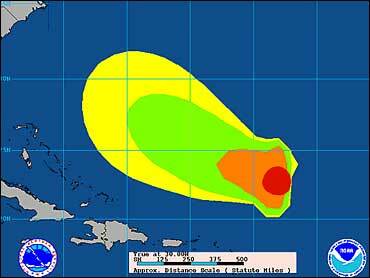 At 11 a.m. EDT, Irene was centered about 810 miles southeast of Bermuda and about 455 miles northeast of the northern Leeward Islands, forecasters said. It was moving west at near 10 mph and was expected to continue that motion over the next five days in the general direction of the U.S. coastline from Florida to the Carolinas, the hurricane center said. Irene became a tropical storm Sunday, the ninth named storm of the Atlantic hurricane season. Normally, there are only two named storms by this time of year.